Individual donors, organizations and congregations are stepping up to help sisters-in-training meet debt-free mandates. Sister Josephine of Sisters of the Holy Family of Nazareth, far right, speaks with Justin Leedy and Cialinett Colon. All three turned to The Laboure Society to help them pay off college loans in order to enter religious vocations. Toni Garrett’s criteria for choosing the University of Dallas was simple: she wanted a college that was small and filled with nice people. She was surprised to find, upon arriving, that she had picked a Catholic university steeped in religious tradition. But the Baptist-raised Texan discovered both the school and faith to be a good fit as she studied politics and business — even traveling to Rome to see Pope John Paul II speak. After graduation, she landed a job as a bank teller. As her career grew, so did the love for the Catholic Church that began in college. A pull to become “closer to God, more authentic” led her to a spiritual director and, eventually, the realization that her true calling might not be in the bank, where she would advance to become a vice president managing 200 people, but in the convent. But when she turned to Google to learn more about becoming a nun, she realized she had a $60,000 problem: her student loans. Garrett’s dilemma reflects a growing challenge facing the United States’ nun population, which has declined significantly over the past 50 years. Young adults called to the church, like graduates pursuing many professions, are finding themselves saddled with tens of thousands of dollars in debt that can take decades to repay. But unlike in other fields, long-standing requirements that nuns are debt-free by the time they take their vows can delay — and sometimes deter — those interested in joining religious life. Eighty-five percent of applicants to congregations affiliated with one leading association of religious sisters reported carrying educational debt at the time of inquiry, a major 2012 study commissioned by the National Religious Vocation Conference found. The average amount owed by those applicants, the study found, was $31,000. Both figures track with nationwide figures for student loan debt. While some religious institutions have the resources to take on debt for some applicants, many cannot. Two-thirds of religious institutions that received inquiries from individuals with educational debt had to turn people away for that reason over the past 10 years, the NRVC study, conducted by the Center for Applied Research in the Apostolate at Georgetown University, found. 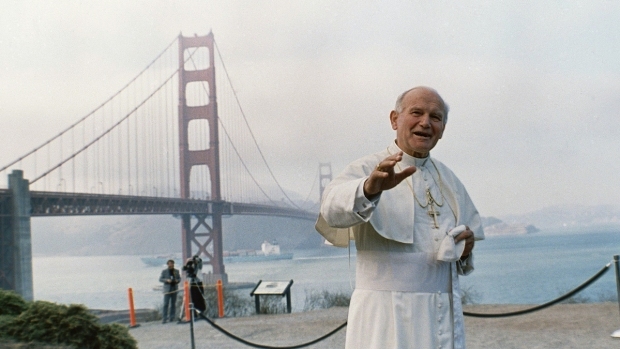 Popes in America: 50 Years of Papal Visits to the U.S.
“This is a really sad statistic,” said Kathleen Sprows Cummings, director of the Cushwa Center for the Study of American Catholicism at the University of Notre Dame. "They don’t want educational debt to be the primary factor in whether to accept a woman or not, but where does it fall, how do you deal with that?” she added. Historically, Cummings says, women pursued higher education after pursuing religious life, often at a women's college affiliated with their organization. Now, the opposite is largely true — 61 percent of women who took their vows in 2014 had already obtained a bachelor's degree, according to one survey. More than half the institutes responding to the NRVC study said they had seen an uptick in inquiries from people with student loans. While the trend toward heading to college before the convent can equip congregations with sisters who have skills and experience to enhance their service missions, especially in fields like teaching and health, the high costs of the debt that comes with degrees is creating lasting financial strain. Pay earned by sisters who join active, or apostolic, communities can vary greatly, depending on the type of ministry work and level of experience. The salary goes to the community, though sisters can receive a stipend to cover personal needs. “The challenge now is how to deal with this thorny problem in a way that’s going to be best not just for the immediate term, but to sustain these congregations over time," Cummings said. At Daughters of Mary of Nazareth in Boston, created in 2011, three of the community's seven sisters have struggled with student loans, according to the congregation’s Mother Olga of the Sacred Heart. One woman, who had $60,000 in loans from undergraduate and graduate degrees, worked full-time for five years in an attempt to clear her debt. She still had about $15,000 to pay at the end of that period. “It’s a blessing that in our country we have so many resources for education, but at the same time it breaks my heart,” said Mother Olga, who previously worked in campus ministry. She encourages women exploring religious life to set and stick to a strict budget — and take steps like selling their cars, discontinuing cellphones and moving back home with their parents in order to save money — and ask family and friends to consider donating to their cause in lieu of birthday or other holiday gifts. One woman has even created an online fundraising campaign to help her finish paying off the $20,000 that remains from her bachelor degrees in theater and English. She’s raised about $2,500 so far. Often they work toward the goal during the yearslong process of becoming a nun, called formation. A number of Catholic organizations, from small nonprofits to major associations, have also stepped up to help women and men gain the financial freedom to pursue a religious life. The National Religious Vocation Conference created a new fund after reviewing its survey results and hearing for years that its member vocation directors are seeing “more and more” strong candidates with educational debt that their communities cannot afford to take on, Executive Director Paul Bednarczyk said. The National Fund for Catholic Religious Vocations, seeded with $2.5 million from the Conrad N. Hilton Foundation, will cover educational debt for accepted candidates as they go through formation, assuming the balance of the loan once they take their vows. Bednarczyk said they plan to issue the first grants to religious communities in June of this year, timed to capitalize on interest and inspiration related to Pope Francis’ September visit to the United States. Individual donors, institute endowments and groups like the Knights of Columbus Fund for Vocations also assist with debt relief. Garrett turned to one such organization, The Laboure Society, to help pay down her loans before entering religious life. The concept behind Laboure was born almost two decades ago, when Cy D. Laurent, then a businessman, met an aspiring nun held back by student loans. With the help of friends, he raised enough to pay off the roughly $12,000 she owed. The organization, which he launched years later, now teaches aspirants leadership and communication skills while they work as a group to raise money to pay their loans as they go through formation. One hope is that the process, which emphasizes the sharing of personal stories, will encourage more people to explore religious life. “One of the things that affects religious vocations today is that there are less sisters out there ministering in the parishes and the schools and so we have girls that may not have that interaction, that may not question whether they are called," said Cialinett Colon, a Bronx Family Court legal program coordinator who is working with Laboure to help pay off $100,000 in undergraduate and law school loans so she can join Sisters of Christian Charity. Laurent said the need for aid has grown as both the cost of education and the age at which young people are ready to make significant life commitments — in both religious and secular life — rises. Because of that, he's planning to significantly expand his effort, which he says has helped 260 women and men pursuing religious life. Garrett was able to meet her goals in 2012 by following the program’s structure of asking family, friends or acquaintances for a “contribution of prayer, a contribution or money or a contribution of referrals.” She said she easily sent more than 100 letters and scheduled at least 25 in-person meetings over the course of the year. Now Garrett, whose religious name is Sister Josephine, is undergoing a two-year period of praying, studying and reflecting in Chicago with the Sisters of the Holy Family of Nazareth. She’s hoping to take her vows in the early fall, around the time Pope Francis arrives in Philadelphia for the 2015 World Meeting of Families. “I’m sending the Pope an invitation, actually,” she said with a laugh.